Scion and Otago University joined forces and combined their respective expertise in packaging and consumer perception to establish new relationships with Chinese packaging researchers and manufacturers. 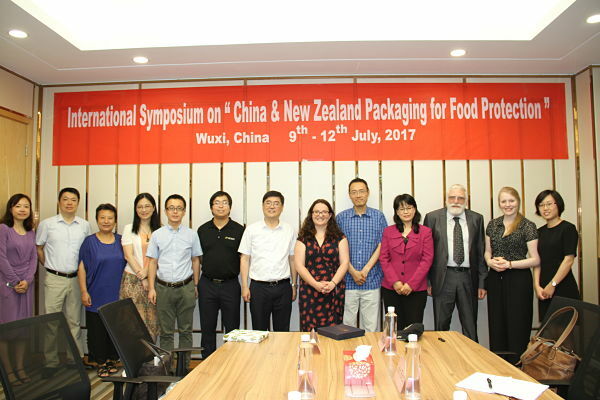 With funding from the New Zealand China Food Protection Network, representatives from the organizations travelled to China to host a workshop specifically on packaging for food protection and to visit local players in the packaging industry. Lou Sherman, Packaging Research Leader at Scion says packaging is an integral part of most food products, especially those that are exported. In a New Zealand context, packaging supports the export of more than one billion dollars’ worth of goods through containment, protection and communication. The workshop was held at Jiangnan with attendees from Tianjin University of Science & Technology, Jinan University and University of Auckland. Some local school students saw the workshop advertised online and attended as they are interested to learn more about international packaging research. The workshop was also watched via Zoom by five participants back in New Zealand. Topics of joint interest including food contact safety, antimicrobial packaging, sustainable materials and smart packaging were discussed. We are now actively seeking opportunities to fund future New Zealand and Chinese collaborations on this space.